Pádraig Harrington could have been forgiven for slinking quietly away from the Abu Dhabi Golf Club on Friday after missing the cut by a shot in his first event of the season where there was a cut to miss. If he was still thinking of another disappointing week on the greens - perhaps the four and a half footer he missed for par on the final green on Thursday - it didn't show in the photos after he signed for a 74 that left him one shot from safety. With just two birdies to show for his week's work - none in the second round - Harrington might even have been thinking back to his victory speech following his Open Championship win at Carnoustie in 2007. Six and a half years later and McIlroy now has two majors to Harrington's three. On the evidence of what the press saw in Abu Dhabi on Friday, where McIlroy played his last 11 holes in six under to move from the cut line to within two of the lead, several hacks were seeking odds on a Holywood major double this year. For the record, McIlroy is 1/5 to win zero majors with Paddy Power, 7/2 to win one, 14/1 to win two and just 66/1 to win three. The Rory Slam is a mere 200/1. Scotland’s Craig Lee (67) and Rafael Cabrera-Bello (68) lead the Abu Dhabi HSBC Golf Championship by a shot from Danny Willett (63) on nine under. But all talk was of McIlroy's performance. Had it not been for a double-bogey six at the sixth, where he hit a three-wood into a bush and had to take a penalty drop, he might well be leading. Either way, the story is the contrast between his play so far this week and the way he limped away from the event with his new Nike sticks between his legs 12 months ago. That he did it in the group ahead of Harrington only served to show highlight the 18-year age difference between Ireland's two greatest players and the direction their careers have taken in recent years. Hampered by his lack of confidence in his putting, Harrington is like a Rolls Royce with a Honda 50 motor under the hood. McIlroy is a brand new Ferrari. Twelve months ago, the then world No 1 shot two 75s and barely found a fairway. He was demoralised, chastened, confused and under pressure. Fast forward a year and he's never sounded more excited about his game, which only poses more questions about his exact state of mind during the 2012-13 off season. “I don’t feel like I’ve struck the ball this well in a long time,” McIlroy told reporters. “It’s gradually been coming. I’ve been working hard on all aspects of my game. I came here excited for the season, and I’m in with a chance to win going into the weekend. He added: "It is a good position to be in and I am excited. It is a great way to start the season, being in the mix with 36 holes to play. "I hit a poor tee shot on the sixth and took a double-bogey there but I did well to get back to level par for the round at the ninth. I gave myself a target of four under for the back nine. "I felt if I could do that I would be right there for the weekend and I managed to go one better." The highlight of McIlroy's round was not the lucky recovery from rough at the 14th that hit the pin and gave him a tap in birdie but the two blows he struck to the 18th. Few in the field could go for the green in two, never mind reach but McIlroy's drive was massive and his three-wood finished pin high. The eagle putt missed by a whisker. But he wasn't greedy. "When I'm driving it well it makes it so much easier," he said. "Could have been even better if that putt had dropped at the last but two or three behind at halfway is decent. I'm right in contention and that's a great place to be in my first event of the year." Harrington missed a 10 footer for birdie at the last that would have given him another two rounds. Instead, he was left to reflect on a disappointing week. He hit just four fairways and only 10 greens on Friday and when he did hit a green in regulation, it led to a two-putt. As a result, he was 115th out of 125 for putts per green in regulation. He was joined in missing the level par cut by Simon Thornton (71-75, +2), Peter Lawrie (73, 74 +3), Shane Lowry (76, 71 +3) and rookie Kevin Phelan (72, 76 +4). That meant that just six of the 11 Irishmen in action made the cut with McIlroy tied for fourth with Ricardo Gonzalez and Ryder Cup aspirant Thomas Bjorn on seven under. European Ryder Cup skipper shot a 72 as playing partners Tommy Fleetwood (65) and Thorbjorn Olesen (70) got the upper hand this time. Still, the Dubliner is tied for 13th on four under with Michael Hoey, who had another great ball-striking day and carded one birdie and 17 pars in a 71. Damien McGrane also made just one birdie in a 72 to share 33rd on two under while Darren Clarke rebounded from three over with 11 to play to make the weekend. He hit 16 greens in regulation and made birdies at the eighth, 10th, 13th and 17th for a very fine 69 and was joined on one under by Gareth Maybin, who shot an immaculate 70 to leave them tied 43rd. 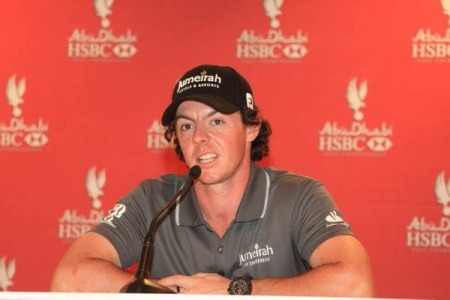 Rory McIlroy shows of his powerfully built forearms in Abu Dhabi. Picture by Fran Caffrey/www.golffile.ieIt seems like only yesterday that Rory McIlroy was watching Tiger Woods play in Dubai, dashing around the grounds of the Emirates Club with pal Harry Diamond like a couple of schoolboys after the final class of summer term. McIlroy angry after white line penalty: "There are a lot of stupid rules in golf"
JP McManus to call time on charity Pro-Am?